"Movies move! How it moves is as important as what moves." 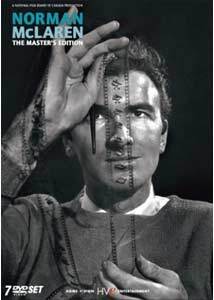 Scottish-Canadian filmmaker Norman McLaren has received his proper due with an in-depth seven-disc boxed set from Home Vision and the National Film Board of Canada. McLaren was born in Scotland in 1914, getting his start in film studying at the Glasgow School of Fine Arts before moving to London, where he joined the General Post Office Film Unit. While there, he made Love on the Wing using the technique of drawing on the film itself, the result of which was considered too avant garde by the GPOFU. Leaving Europe for New York in 1939, he made his way to Canada and joined the National Film Board, where he would remain for the rest of his career, working on whatever he wanted, whether with collaborators or by himself. His work spans the aforementioned method of drawing on film stock to paper cut-outs to stop motion to traditional live action material to chalk drawings. McLaren even experimented with electronic music, incorporating it into his films in vital ways. The set is intriguingly laid out according to themes, interests, and collaborators of the director, and the producers have taken the unusual step of duplicating films across multiple discs where necessary if they slotted into more than one focus, which many here do. Each group is led by a brief featurette that provides a general introduction to the material we're about to delve into. The seventh disc (and part of the sixth)fconsiders McLaren himself, with vintage documentaries and restoration information about his work. Capping off all this is a slick illustrated booklet with essays, further references, and comprehensive indices detailing the films via focuses and chronology. The booklet is 80 pages, with one half in English, which then flips over and is repeated in French. The themes include "Painting With Light," "Surrealism," "The Art of Motion," "War and Peace," "Dance," and "The Animator as Musician." Collaborators include Vincent Warren, Grant Munro, Maurice Blackburn, and Evelyn Lambart. Again, because many fit into more than one section, you'll find the classic Blinkety Blank on Disc 1 (McLaren and Space, Painting With Light), Disc 2 (The Art of Motion, Surrealism, Maurice Blackburn), and Disc 5 (The Animator as Musician). There is still a large array of films here, so no need to feel like this is an attempt to pad the set. My only complaint about this set up is the lack of a Play All feature within each theme. Each film has an index page with details about its particular technical details, and some include audio clips of McLaren discussing them. The films themselves are a remarkable body of work by any standard, and well worth the time and effort needed to navigate to them. Check out the vividly animated Blinkety Blank, animated Quebeçois songs La Poulette grise, L�-Haut sur ces montagnes, and C'est l'Aviron, and the classic jazz-scored Begone Dull Care. There's also Lines Vertical, Lines Horizontal, Mosaic, and La Merle. The beautiful Pas de deux highlights the "Dance" section, and the surprisingly violent Neighbors, which won an Academy Award, highlights the "War and Peace" theme, as does A Chairy Tale. Movies move, McLaren told scholar Donald McWilliams, and this set allows us to see some of the many ways they do so. Image Transfer Review: Generally speaking, the producers have done a very nice job with this, detailing in the booklet the lengths to which they went transferring each film. Their only misstep was meant well, but will (and has already) aggravated many. Similar to Criterion and their attempts to assist those still using older televisions, the transfers have been windowboxed; and when I say windowboxed, I mean really windowboxed, with a generous amount of space that is intended to fend off anyone's monitor overscan. With McLaren often working to the edges of the frame, the producers did not want any of that detail missed by viewers, hence their decision. A nice idea, but if this had to be done, it could have been done in a much less vigorous fashion, allowing us more of the actual image. I certainly don't consider this a reason to avoid the set, but some more militant types have found the practice offputting. All that aside, I did notice a small percentage of films where combing occurred during motion sequences. I have not been able to look at the pieces in question on another player, so the problem may be a result of my player rather than something within the coding of the discs themselves. The majority of the material did not have this problem, though. Audio Transfer Review: Audio is available in three "flavors": original mono, Dolby 2.0, and Dolby 5.1. Frankly, the original mono was good enough for me, and it sounded perfectly fine. Extras Review: It's hard to judge what is and isn't an extra, given the way the discs are constructed and laid out; there are however, plenty of test films, unfinished films, and documentary materials here to satisfy the interested viewer, not to mention the booklet, which has valuable information as well. So let's focus on the documentary materials. Each disc has a short featurette tied to each focus, giving the viewer a very brief overview of that aspect of McLaren's work. They really aren't terribly in depth, hardly surprising given the length, but are usually worth a look. The beefier documentaries come on Discs 6 and 7. On Disc 6, we have Experimental Film: Excerpt (02m:27s), McLaren on McLaren (07m:56s), and The Eye Hears, The Ear Sees (58m:46s). The latter appears to be a British documentary looking at McLaren's career, with ample interview material and film clips. Certainly worth the time, as is the major piece of Disc 7, an episode of the French series Cin�ma de notre temps (55m:06s) focusing on McLaren, which is more self-consicously arty in execution but again full of worthwhile material. Also on this disc is a fascinating 1973 documentary on the Alexeieff and Parker pinscreen animation technique, titled simply Pinscreen (38m:43s). McLaren only dabbled in pinscreen, not finishing anything beyond tests, claiming he didn't have the patience needed to work with the techique. So the inclusion of the documentary is a bit questionable, but as someone who finds the Alexeieff-Parker work very interesting, I was happy to see it. McLaren did appear to be present during the film, so there's one small tie-in there. The booklet that is included is solid, even if it left me wanting more in terms of text, like essays and so on. What is included are a handful of brief essays covering McLaren, and the restoration of the films. Also present is a detailed index grid covering which films fit into which focus group and what disc they're on. The films are alos listed chronologically, and numerous pictures are included as well. The set is packaged in slimline cases, each decorated with detail from McLaren's films. Easy to read, white English and French subtitles are available where necessary. Those interested in experimental film and/or animation will want to look into this seven-disc set collecting the works of Norman McLaren, has plenty to engage the viewer, allowing a true appreciation of his entire career, from early attempts through World War II propaganda on to his renowned abstract works. A wealth of documentary material provides plenty of background interviews and commentary, along with a useful reference booklet. Despite some sporadic problematic video, this is highly recommended.